Surgical site infections (SSI) are a major cause of morbidity and mortality in the US hospitals. Airborne bacteria in operating rooms (OR) may contribute to SSI. In Europe, regulations exist to limit the airborne bioburden in the ORs. Unfortunately, no equivalent environmental indoor air quality standards exist in the US. With emerging scientific data regarding the contribution of air contamination to SSI, there is increased interest in considering innovative supplemental technologies to support best air quality in the ORs. A newly commercialized HEPA/UV-C air recirculation/filtration system (HUAIRS) was evaluated as to its efficacy in reducing airborne bacteria present in a plastic surgery OR at an outpatient surgery center. 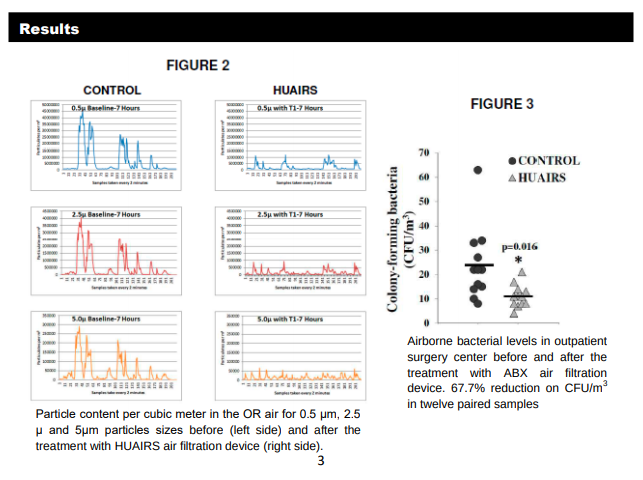 Particle quantification data is well aligned with airborne bacterial contamination findings. For the cultured samples obtained, there was a 67.7% reduction in CFU count. The HUAIRS device is effective in reducing airborne contamination and improving air quality in the OR, supporting reduced SSI risk for patients and improved safety for the surgical team. Aerobiotix, Inc. is an innovative company driving leadership in advanced air quality products for the healthcare market. Aerobiotix, Inc. designs, develops, manufactures and markets novel technologies to build healthy environments worldwide.